In NYC we played "Off the crack" "King" and "Potsie" with these among other games. 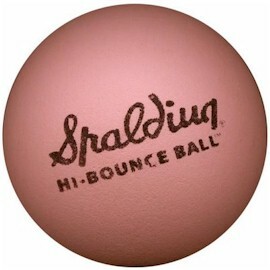 Brand new Spaldings looked good enough to eat, because they were the same color as the fragrant pink bubblegum that came inside a package of baseball cards. If you had one of these, you could play just about anything. Same here! Stickball was big on the streets of Brooklyn using broom handles. Couldn't play unless we used spaldeens! We used to play a street game we called "War" or maybe "I Declare War" where we'd each choose one brand of car, say, or cigarette. Then the kid with the ball would bounce it hard, yelling, "I declare war on...(bounce)...Salem!" (for instance) and he and all the others would scatter in all directions. But "Salem" would have to double back, retrieve the ball, and yell, "Freeze!" Then he'd locate the nearest opponent and throw the ball at him. (I think maybe he could take seven big steps first.) The kid thus tagged would be "it" for the next round, and would be the one bouncing the ball and declaring war on someone else. If a ball went into the yard of our next-door neighbors, it was gone forever, 'cause they wouldn't let anyone go in and get it. I always imagined that their attic was crammed full of lost balls of various sorts. Also, they actually called the police a couple of times when kids were playing football in the street in front of their house. Nobody bothered going to their house on Halloween.